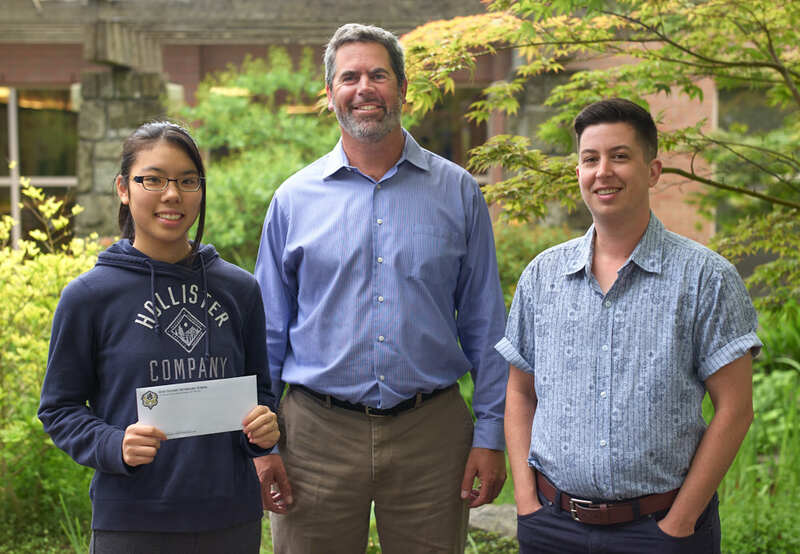 Gulf Islands Secondary School (GISS) student Tamaki Yoshihara (left) displays her 2017 Forum Youth Scholarship. Principal Lyall Ruehlen (middle) and Forum Manager Julian Paquette (right). Since its inception, the Salt Spring Forum has been committed to youth engagement and leadership. Through our thriving partnership with the Gulf Island Secondary School (GISS), we offer many exciting opportunities for youth including volunteer roles. Please contact us to learn more or to get involved! The Salt Spring Forum and the GISS Student Council also bring a number of speakers directly into the school for Forum-style events during school hours. These amazing events, moderated by recent graduates of GISS, are attended by 100s of students and Forum members. They are not to be missed! Why Volunteer with the Forum? The Salt Spring Forum highly values youth participation and offers free admission for students (and low-income residents) to Forum events providing the tickets are still available at the time they are requested. In order to receive a free student ticket, students must email forum@saltspringforum.com.